AAfG stands in solidarity with the people of Halkidiki, Greece, who are defending their livelihoods and the natural environment in the region. The ongoing environmental destruction and threat to the livelihood of the people of Halkidiki, Greece – most noticeably at the primeval forest of Skouries – must be stopped! This region is covered by primeval forests, some of the few remaining “lungs” of Greece, a country which sees many of its forests being burnt to ashes every year. The existing destruction of these forests continues at an unprecedented scale. The ground and freshwater of the area is being polluted by toxic chemicals used in gold-mining and local agriculture suffers by the hazardous waste produced, which raise serious concerns about the life and health of the local human, animal, and plant populations. The region – traditionally, significant for agriculture and tourism – is being converted into a heavy industry area, effectively robbing many local people from the income that has sustained them for generations. Job losses are certainly going to be higher than the handful of those created by the development of mining in the region, however, the Greek state has failed to acknowledge these, along with the other concerns. Rather, it has fast-tracked and de- regulated mining exploration in the region – itself being a gross dereliction of duty owed to the people and under Greek regulatory law and the Constitution. The Greek ‘Memoranda’ government sold the gold mines at Skouries to the Canadian company Eldorado Gold for a fraction of their real value effectively making a huge loss. Not only has the Greek public been grossly short-changed here, the environmental disaster and implications of gold-mining in Skouries for agriculture and tourism overwhelmingly outweigh whatever benefit these “investments” bring to the region. The Greek state will not be receiving a single Euro by this “investment”, as the contract over the sale of the mines to Hellas Gold (majority stake owned by Eldorado Gold), includes no provision for leasing or royalties, therefore there’s a windfall of profits for Eldorado Gold while leaving nothing other than destruction for the local economy and environment. 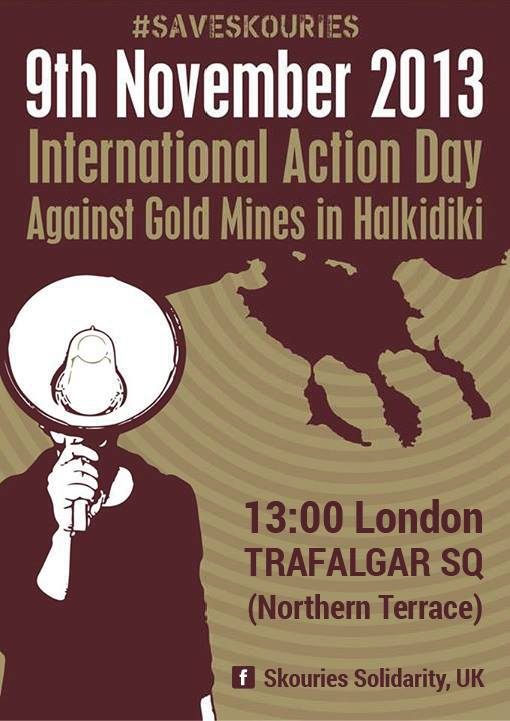 The people of Halkidiki have organised numerous protests of resistance this year, and have stood strong against gold- mining, only to be treated as criminals by the government for their action. They have been treated with contempt by commercial media outlets which, incidentally, support the ‘Memorandum’ agenda, and with excessive police violence. Many of them have been arrested – including school children and old people who took part in the action. The Greek Police, acting as a private security for the mining company, has forcefully and without any legal basis collected DNA samples by people participating in the anti-mining protests in order to intimidate them and prevent further action. Unsurprisingly, para-state thugs linked to Golden Dawn and other far-Right/anti-Left gangs, who fancy themselves as “anti- systemic”, are also intimidating the local population! The people of Halkidiki, however, are not intimidated, and are not giving up the fight. We urge people to support their action to prevent this disastrous venture from continuing, in order to save the precious natural environment of Halkidiki and the future of its inhabitants who depend on it! Please do spread the news and support the Save Skouries movement! Also please consider joining AAfG!